This project was created on 12/01/2016 and last updated 2 years ago. Old and wise men say in this life you have to accomplish four things: plant a tree, build a house, have kids and build an operating system. Yeah, I was puzzled by the last one too but who am I to contradict the old and wise ? The "elders of the internet" have spoken when I saw this contest on Hackaday. To make sure my "things to do in this life" list gets shorter and shorter , lo and behold in all its glory my 1KB ARM Cortex M0 real time operating system. Project is complete and available on GitHUB (link should be on this page somewhere). I finally managed to upload a video in which I talk a little bit about what an RTOS is and then I step through the code to show you the big building blocks. I will try to upload some technical presentations as well soon. 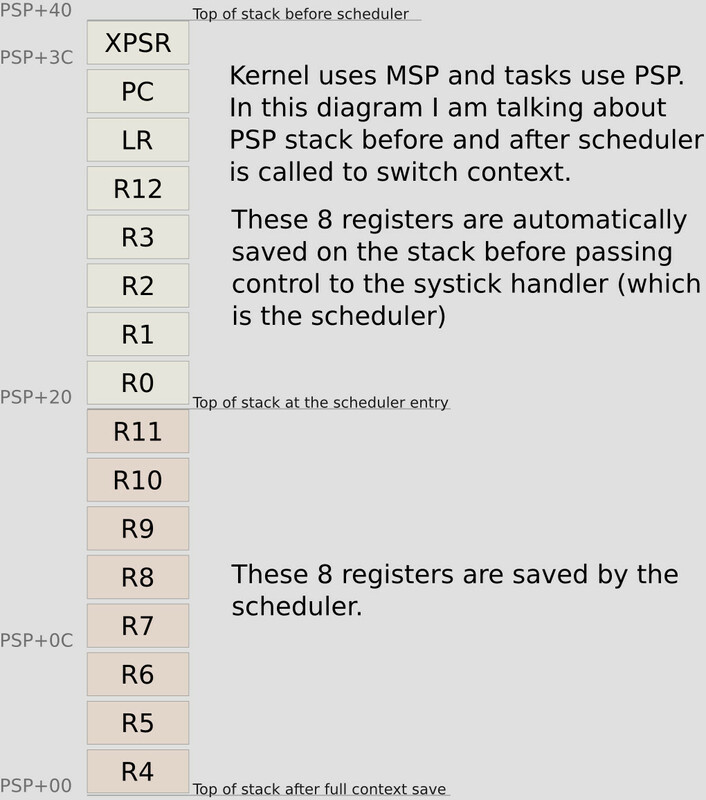 I realised I made a mistake with the last diagram and used MSP for indexing instead of PSP. I corrected the image and re-uploaded to this project. A few people asked me why I defined these two macros in the assembly source file. There is nothing wrong with "bl subroutine" or "bx lr" but these two macros help me read the code faster when I look for specific subroutines. I call it "professional defect" since most of the days I stare at Intel assembly and I am used to mentally separate code blocks in a specific way. I used to get random faults from time to time and these things are quite hard to debug. After a lot of hours I managed to finally isolated the issue in the mutex handling system. I redesigned the system, it&apos;s much more robust now and it didn&apos;t fail yet like the old system. Bad part: I had to remove the string from the code :) It&apos;s now 1024 bytes without any string. I will try to optimize some more size-wise so I can put back the string at least partially. On another note, some more docs are coming, stay tuned ! I replaced the infinite loop in the idle task with "wfi" instruction. Theoretically this should put the processor to sleep until the next systick interrupt and this will save energy. I said theoretically because it needs some setup but it seems to work out of the box so I will keep it as an option. I also uploaded the RAM memory map. All sources are fully commented but proper video documentation will follow in the next couple of days. If there is enough interest I might even make a step-by-step building videos. Is the source code for this project available? for public use? I was looking for something like this to use on a Teensy 3.6. My idea was to make some kind of Google Glass... But my knowledge of the matter isn&apos;t much. Better leave it to someone else. awesome! submit the project to the 1kB contest hosted here at Hackaday. I&apos;ve got mine there I should not say that eheheh... :-) Oh you did, great! You are about to report the project "M0S - CortexM0 RTOS in 1024 bytes", please tell us the reason.